It's really funny. 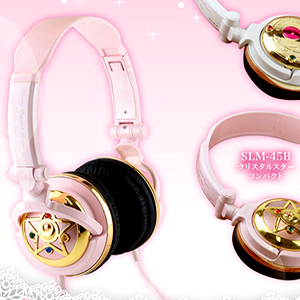 I'm not really a Mini Moon fan but out of the two covers I've chosen the main pink one, the artwork is that good! Pioneer really did a good job of adapting the original Japanese cover. Whoever the graphic designer was for these Heart Collection DVDs they sure need a raise! The reversible cover this time is well drawn image of Sailor Neptune and Uranus in an embrace. Like the Mini Moon cover, this one is also adapted from the Japanese release though this one looks basically the same with a slightly different colour scheme. The menus on this third volume actually follow the cover character this time around and focus on Mini Moon and her transformation. We get a nice still image of her for the main menu with the usual heart transformation animation loop running to the side. Overall it looks very nice, loads fast and the transitions between each menu using her crystal work really well and are very smooth. There was a slight bug in the subtitle menu though when watching it on my TV screen; the letters "in" in "Main" were cropped off. On my computer it was fine but I guess the designers just placed the text too close to the edge for the TV users. 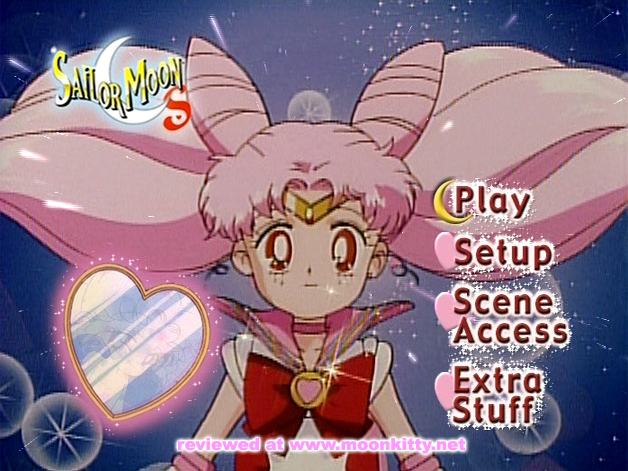 Along with the "Sailor Gallery" featuring Sailor Mini Moon (Chibi Moon) we also get the first Japanese Opening Credits! It may seem like a small addition but, let's face it. It's something we all wanted to see included. All the episodes on this DVD, and throughout the Sailor Moon S and Sailor Moon SuperS series, are "uncut" which means that while they feature the same English audio form the tv version, all the funky transitions no longer exist and the original Japanese episode titles are used. Visually no footage is cut though strangely the next episode previews are missing. It is worth noting though that on the Japanese DVDs, these previews are counted as special features and not part of the episode so it's not really a big deal and isn't missed at all. 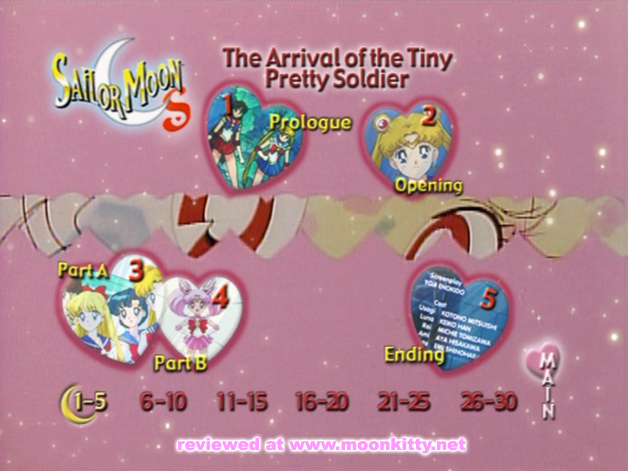 The first episode on this disk, The Arrival of the Tiny Pretty Soldier (Hello, Sailor Mini Moon) features the return of Rini (Chibi Usa) who is now an awoken Sailor Soldier and has a lot of comedy literally seconds after she makes her appearance. Really well animated and an episode that can be watched multiple times. Seeking Friends! Chibi Moon's Actions (Tainted Tea Party) wins my vote for the funniest episode of the Sailor Moon anime out of all five seasons. No matter what version you watch you will be on the ground in stitches. Hilarious from beginning to end. Note: Keep and eye out for the Crayon Shin Chan (popular Japanese anime) references! The third episode, Wanting More Power! Maka-Chan's Lost Path (People Who Need Power) focuses on Sailor Jupiter and is a fantastic example of how fun it can be when the girls leave Tokyo for a bit. Definitely the must watch episode of the DVD, The Bond of Destiny! The Distant Days of Uranus (Related By Destiny) reveals the origins of Sailor Neptune and Uranus with some fantastic animation, visuals and plot. Highly recommended. The next one, Art is an Explosion of Love! Chibi Usa's First Love (Art Appreciation) however could easily be skipped if it wasn't for a subtle clue involving the Chalice. Very filler and almost rips off an episode form the first season entirely! The final episode though rebounds nicely as Usagi's Dance, in Time to a Waltz (Everything's Coming Up Rosey) is the famous episode where Sailor Moon gets drunk! While this DVD features one or two misses, the several hits more than make up for them. Well worth a look.